As the saying goes: don’t judge a book by its cover. 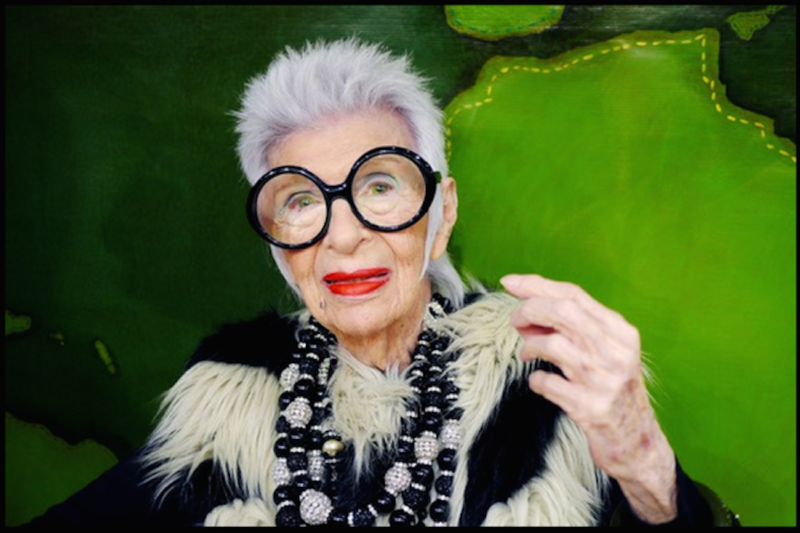 But in the case of Iris Apfel, Accidental Icon: Musings of a Geriatric Starlet, you should. We talk over a series of phone calls and meetings during the week of her book launch, which was the same week Mattel introduced the new Iris-styled Barbie. Lest the reader assume a fashion hero is superficial, to meet Iris is to realize that the opposite is true. A strong sense of self-possession and quick repartee is almost intimidating in person if it weren’t for her sense of humor. “If you don’t dress like others you don’t have to think like others,” she quipped. “Whatever happened to the cultivation of an inner self?” she asks in her book. “It’s painful and it’s work, but it always pays off.” In the crowd at Bergdorf’s a number of her friends are dressed in Iris-spirited pairings of fabric and ornament reinforcing that she’s inspired a maximal genre. It feels contagious and liberating. Why bother with a book at this point? “I wanted to write something not boring that would be accessible to all my young fans.” Judging by her Instagram account that number is significant; her followers number nearly a million. The fandom was an unplanned result of a phone call. One day in 2005, Harold Koda, then-curator in charge of the Costume Institute at the Metropolitan Museum of Art, called to ask Iris if she would be willing to lend some of her wardrobe collection for an exhibit. “I agreed because I thought all I had to do was place my things in beautiful cases,” she said. Ultimately accessories, as well as garments, were displayed, eighty ensembles total. Iris styled every one and loved it. The show was a blockbuster success with lines outside and down the stairs. She was surprised as much by how people reacted to her as how she reacted to them. With her husband, Carl, Iris co-founded the textile firm Old World Weavers to do meticulous reproductions of antique fabrics for high-end clients. Among the most prestigious were the nine White House Administrations they advised. Iris and Carl traveled year-round in Europe, North Africa, the Near and Middle East to source materials and work with mills. She loved the hunt whether in a museum archive or a souk. Long before this years’ Met Gala celebrated the Vatican’s closet and the Catholic Imagination, Iris was tailoring for herself a nineteenth century priest’s silk velvet chasuble, a kind of tunic, she found in a French flea market. “I started to collect them, which I suppose, is one avenue to building a wardrobe,” she says. “Students tell me I’ve changed their lives. It’s very satisfying,” she muses. With her profile rising, advertisers called, such as MAC Cosmetics and Macy’s. They wanted her to help create limited editions as well as to be the face of brand. “I’m the oldest living broad that ever graced a major cosmetics campaign,” she joked. Then in 2015, when Albert Maysles released a documentary film, “Iris,” her wit and passion were visible to the world. These days Iris sells a line of jewelry and fashion on the Home Shopping Network. “When I’m pedaling my creations, people call in and tell me I’ve made them think differently about dressing. It makes me happy,” she exclaims. Her thoughts on age-defying beauty interventions? She quoted Coco Chanel, “Nothing makes a woman look so old as trying desperately hard to look young.” What about age-defying attire shopping? It’s an underserved market, she stated. “I wanted to open a very chic boutique on Madison Avenue called The Sleeve. Everything dressy is sleeveless and designed for very young women,” she observes. Iris Apfel, Accidental Icon: Musings of a Geriatric Starlet is published by Harper Design. This essay was featured in the June 3rd edition of The Sunday Paper, Maria Shriver’s free weekly newsletter for people with passion and purpose. To get inspiring and informative content like this piece delivered straight to your inbox each Sunday morning, click here to subscribe.